Whether we like to admit it or not, none of us is invincible. We can become sick or have an accident and end up in the hospital for days or even weeks. If we’re lucky we have health insurance that covers all or at least most of the expenses we rack up. And these can be huge. I’ve heard of hospital bills that totaled $100,000 or even more. I had a small procedure done recently to remove a basal cell carcinoma from my nose that took about an hour and cost $700. Big medical bills can be even more complicated when there is an insurance company involved. If you received a statement recently from a hospital or clinic, you’ll know exactly what I mean. There were probably categories such as Amount Billed, Amount Covered, Patient’s Responsibility and so forth. In fact, these invoices can be so complicated that you almost need a Captain Midnight Decoder Ring to figure out what you really owe. Hospitals, clinics and even doctors are required to generate massive amounts of paperwork these days. And any time there is a massive amount of paperwork, there is a massive possibility that mistakes were made. Whatever you receive a medical bill, the first thing you need to do is sit down and review it to make sure you’re being charged for the services you actually received. You can probably ignore the small stuff as you may or may not remember that you were given two aspirin at 4:00AM one day, but watch out for charges such as a PET scan you don’t remember. If you have health insurance, the second thing you need to do is to make sure you understand your policy. It could include co-pays and annual and lifetime limitations that might seriously affect how much of the bill your insurance actually covers. If you have questions about your coverage or the bill itself, take it and your policy to your HR department or to the insurance company itself and ask for a complete explanation. 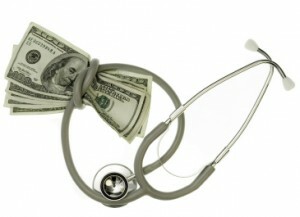 It’s always possible to negotiate medical bills especially if you can pay cash to settle them. I‘ve heard stories of procedures that had been billed at $5,000 but were settled for $200. In the event you can’t settle out the bill, you should at least be able to negotiate a payment plan so you wouldn’t have to pay it off all at once. If you act in good faith, most hospitals and clinics will work with you to develop an affordable plan and might not even charge interest. If you can’t negotiate a payment plan with the hospital or clinic, you might be able to put the bill on a credit card. If so, you could chop it into bite sized payments and spread them out over several years. You would have to pay interest on the debt but this still might be better than trying to pay it off all at once or declaring bankruptcy. Another alternative for paying off a big medical bill is to let us negotiate a settlement for you. Our debt counselors are very experienced at debt settlements and usually save our clients thousands of dollars. We can settle medical bills and other unsecured debts such as credit card debts. We charge no upfront fees so you pay nothing until we can settle all your debts and you approve a payment plan.